The Vespel® wear rings and impellers provide tighter clearances, which means improved pump efficiency and reduced internal recirculation. Their low CTE (equivalent to metal) helps retain those tight pump clearances. In refinery use, replacing metal wear rings with Vespel® CR materials eliminates one fire ignition source and decreases the chance of pump failure. And, as if improved safety were not enough, longer part life means lower cost for repairs, creating a healthier bottom line. In the refinery industry, performance and reliability are not just economic matters, they are matters of safety. 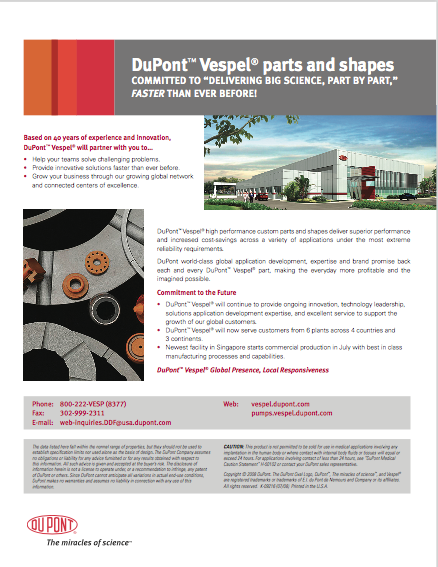 Vespel® CR grade materials are ideal for crucial parts like pump case wear rings and impellers. That is because CR parts retain their mechanical properties even at 550°F. Plus, the CR products improve pump efficiency and offer low friction, high wear resistance, a lower coefficient of thermal expansion than steel and virtually no water absorption. The secret? Parts made from Vespel® CR utilize a highperformance Teflon® PFA matrix with a specially processed carbon-fiber reinforcement.